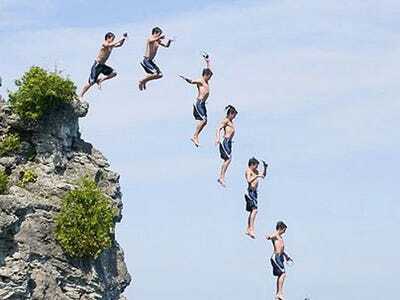 The budget for fiscal year 2012, just published by the White House, presents an optimistic prognosis for US fiscal health. Like all budgets, it looks ahead not just one, but several years.The budget deficit, expected to be 10.9 per cent of GDP in 2011, is projected to fall to 7 per cent in FY 2012 itself (October 2011 through September 2012), then to 4.6 per cent in 2013 and 3.6 per cent in 2014. By 2018, the budget is supposed to show a small primary surplus (surplus before interest expense), something essential if the debt-to-GDP ratio is to be stabilised. Some of the deficit decrease is to come from spending cuts and measures to enhance revenues, but most of it comes from assumed improvements in the economy. Real GDP growth, which is expected to be 2.6 per cent this year, is assumed to rise to 3.6 in FY2012, and then to 4.4, and 4.3 per cent in the next two. At the same time, according to assumptions, the unemployment rate is supposed to fall steadily from 9.6 per cent in 2011, to 8.6, 7.5, and 6.6 per cent for 2012 through 2014. The numbers are not brilliant, but compared to the recent past, they don’t look bad. However, if the assumed improvements in the economy don’t materialise, neither will the deficit reductions. Overly optimistic assumptions for future years may bring short-term political gains at the moment the budget message is delivered, but they spell long-term trouble. They give Congress an excuse for tax cuts and spending increases the country can’t really afford, and they give the White House an excuse for signing off on them. Unfortunately, the experience of the recent past suggests that the Office of Management and Budget (OMB) has had a tendency to look at the world through rose-coloured glasses. 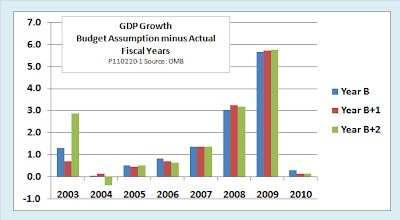 The following chart shows that during 2003 through 2010, the OMB assumed economic growth in the budget year itself (labelled Year B in the chart) would be an average of 1.6 percentage points higher than it actually turned out to be. There were no cases in which budget-year growth was underestimated. The same is true for the year following the year being budgeted (Year B+1). For the second year after the one being budgeted (Year B+2), the upward bias of the growth estimate was 1.8 points, even when the one year that was underestimated is averaged in. Take 2003 as an example. The budget proposal for FY 2003 was delivered in January 2002. That proposal assumed real GDP growth of 3.8 per cent, but actual growth turned out to be only 2.5 per cent. The error, +1.3 percentage points, is shown by the bar B for 2003. The previous year’s budget had estimated 2003 growth at 3.2 per cent, for an error of +0.7 points, shown by the bar B+1 for 2003, and so on. A similar pattern of bias can be traced for the OMB’s assumptions regarding unemployment, shown in the next chart. The unemployment rate for each current budget year (B) was underestimated by an average of 0.9 percentage points. For the year following the budget (B+1), the average underestimate was 1.4 points, and for the year after that (B+2) 1.5 points. No one could expect the OMB’s budget forecasts to be accurate every year. Economic forecasting is an inexact art. What we could hope for, though, would be unbiased forecasts that would miss on one side as often as the other, unlike those of the OMB. The chronic bias toward optimism in the budget assumptions for the years covered in the charts clearly contributed to the budget mess the United States finds itself in today. If more cautious economic assumptions had been used, the tax cuts and unfunded spending increases in those budgets would have been harder to justify, and the national debt might well now be considerably lower. What about the budget assumptions used by the Obama administration? Are they subject to the same optimistic bias as those of the Bush years? The simple answer is that we don’t know yet. The first full fiscal year budgeted by the current administration was 2010, so the above charts each contain only one observation—the “B” observation for 2010—that compares assumptions with outcomes for the Obama OMB. 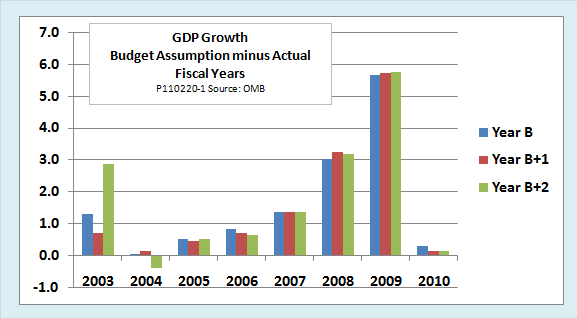 In preparing the FY 2010 budget, which was published soon after the 2009 inauguration, the Obama OMB overestimated 2010 GDP growth by 0.1 percentage point more than the Bush OMB had done in the previous two budgets, but the error was small in all cases. 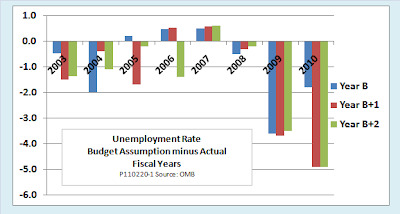 The Obama OMB assumed 2010 unemployment of 7.9 per cent, a large underestimate compared with the actual 9.7 per cent, but the Bush OMB had made even larger underestimates for 2010 in the preceding two budgets. Although we can’t yet compare actual with assumed values for FY 2012, the economic assumptions in the just-published budget may once again turn out to be overoptimistic. In a refreshing change from usual practice, however, this White House freely admits that its just-released budget proposal is not sufficient to put the nation on the path to fiscal health. “To get where we need to go, we’re going to have to do more,” the President said in a February 15th press conference. He went on to address the concerns of those who were disappointed that the FY 2012 budget incorporates so few of the proposals contained in last year’s bipartisan fiscal policy commission. Asked why the commission’s report had been shelved, Obama denied that it had been. Despite his disagreements with some specific proposals, he insisted that it still provided a framework for discussion. Why are things taking so long? He compared those who are unhappy with the fact that the deficit has not yet been eliminated to those who were impatient that it took three whole weeks for demonstrators to oust Egyptian president Hosni Mubarak, after three decades in power. Let’s hope that, working with Congress, he can realise that goal. Follow this link to view or download a short slideshow on the FY 2012 budget and past budget optimism.